I have a couple of obsessions…..well, maybe more than a couple. French chairs are one……can you really have too many? Antique European grain sacks…..love them all. I absolutely adore a Mora clock. There’s just something about their curvy lines and beautifully painted wood. I don’t own a real one….but I do have a couple of faux Mora clocks. They give me the look I want, until I can find an antique Mora, at an affordable price. 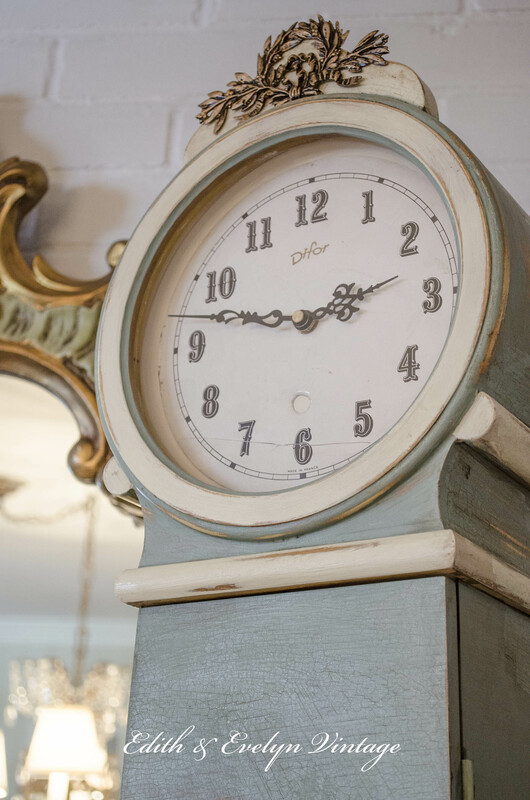 I picked up this very inexpensive, table top clock a couple of years ago at a flea market, and immediately knew that with some paint and some other minor changes, it would make a great faux Mora clock. Here’s what it looked like when I found it. It had the beautiful, curvy lines, and pretty round head that the Mora clocks are known for. 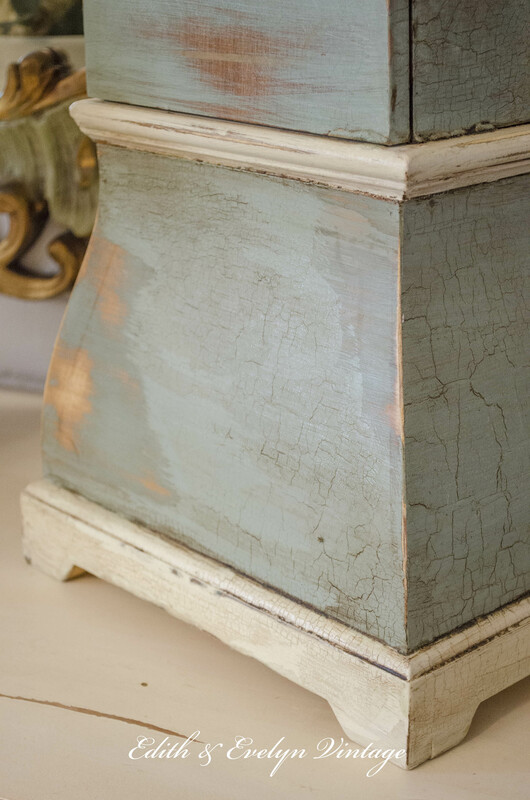 I gave it several layers of ASCP chalk paint in Duck Egg and Old White, then coated it with a crackle glaze to crack the paint for a timeworn look. Then I finished it with clear and dark wax. 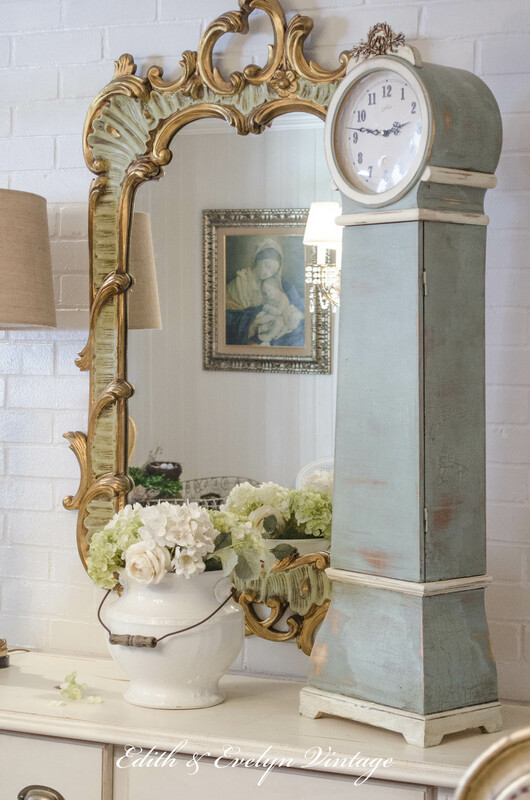 I also found an antique French clock face at an antique market that fit perfectly so I replaced the original one, and topped it with an old brass furniture garniture. It keeps time perfectly and I really like the way it turned out. I am hoping that someday I will find a tall wood base that will fit the bottom, so that it can be a floor clock. For now though, it looks amazing sitting on top of a cabinet. The other faux Mora clock that I have is a reproduction that I found several years ago. It is modeled after the antique Mora clocks, but for a fraction of the price. Unfortunately, the company that I bought this one from, no longer carries them. I would love to own an authentic, antique Swedish Mora clock. I dream about walking into an estate sale, and sitting in a dusty corner will be this fabulous authentic Mora, at a ridiculously low price, just waiting patiently, for me to take her home. Until then, I will enjoy having the look with my faux Mora’s. This clock is placed in the breakfast room, but I’m probably going to be moving it to the family room. 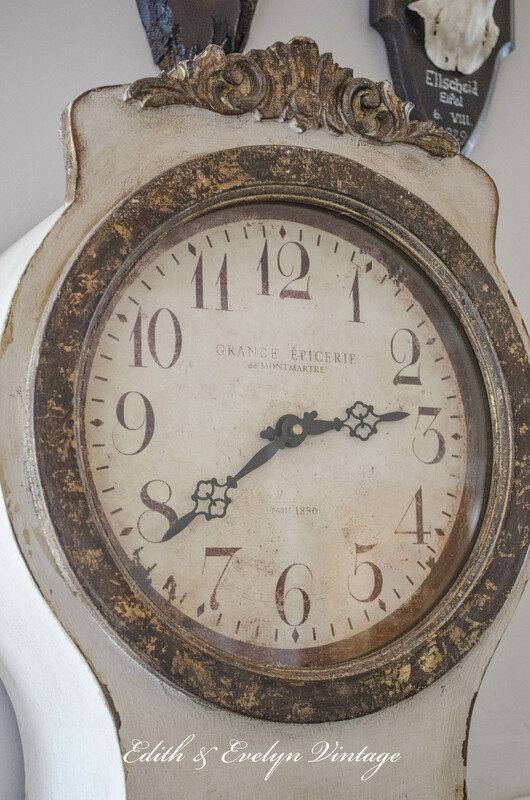 Unless, I happen to find another one…..hmmm….perhaps Mora clocks are like French chairs. Can you really have too many? I want a Mora clock but I never see them for sale at a reasonable price. I am sorry to get off subject but do you like the brick in your eat in area of the kitchen? I love the look but I wanted to ask if it easy to live with or a pain? Thank you for the wonderful article. Hi Kathy! We love the brick in the breakfast area. It was original to the house and a feature that we decided to leave during renovation. I have that same clock. Originally sold at Walmart about 10 or 15 years ago. Thought of redoing or selling mine – thanks for inspiration. Thanks Kim! I wondered where it originated from! 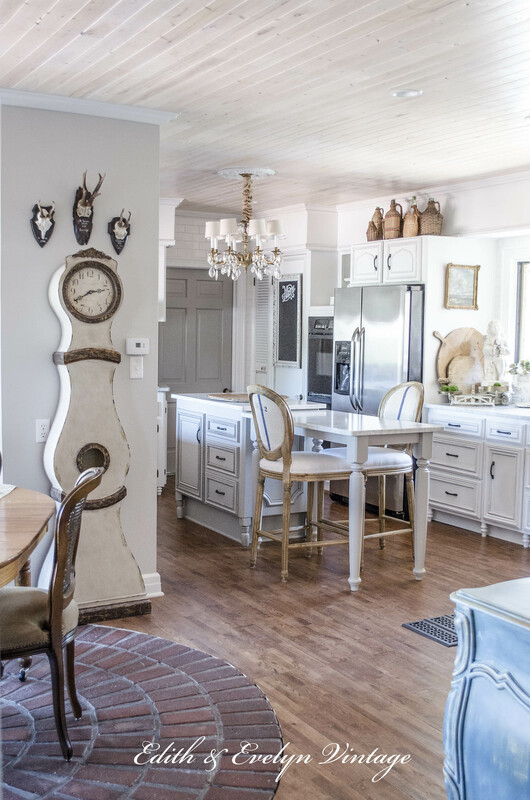 Wonderful job on the clock, and your home is simply lovely! Thank you Linda! Stay tuned, we may have some fabulous information on a Mora clock coming soon! I share your love of the real antique Mora clocks…but I can’t afford the real deal either! Thank you Linda! I love, love Mora clocks! But they are so pricey! I love your revamped Mora beauties!! Love your room. Did u redo the French chairs? Is it on your blog somewhere? I have a night stand and desk in my bedroom with the same legs as your dining room table. Is this french? The desk was missing some veneer on the front and corners of drawers very worn. I filled in with stainable wood putty. NOT sustainable – I tried 2 different kinds. Think its time to paint them. I have never used chalk paint or wax and I am intimidated by it. In the desk top I removed the veneer and did a faux leather finish. Repeated it on the night stand top. Painted the rest dark brown. My bedroom is light grey. What color would u recommend for the furniture? Its a very small room. Some would say I have too much furniture in there. 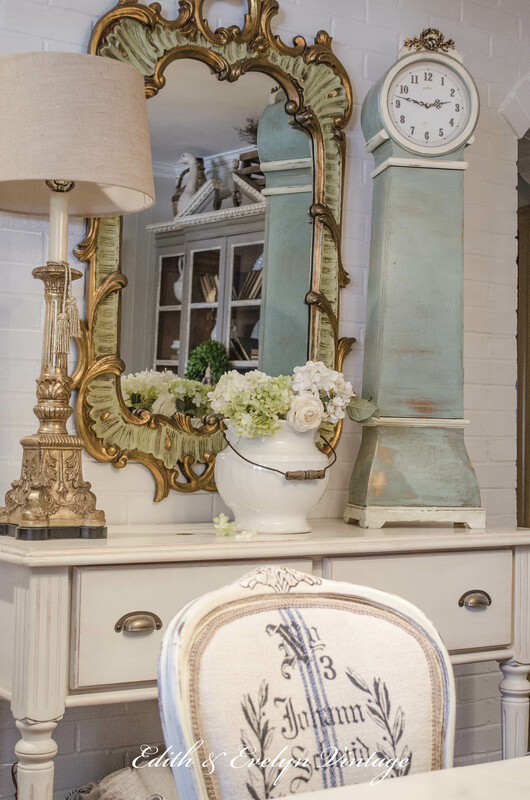 But what do you do with antique pieces you love? Also, have in there a beautiful oak chest of drawers that I stripped layers of paint off. It was my very first project. Unfortunately, two drawer handles got lost (I learned my lesson). Do you have a resource for vintage hardware? Hi Rose!The smaller French chairs at the dining table, I have redone. The larger wing chairs at each end, I did not. The table is not French in origin, but would be considered French in style. Many types of furniture that have the curvy legs are considered French in style, even though they may not actually be from France. If your bedroom is light gray, I would recommend painting white or a darker gray. If your bedroom is a small room, sometimes lightening up the furniture can make it appear larger. 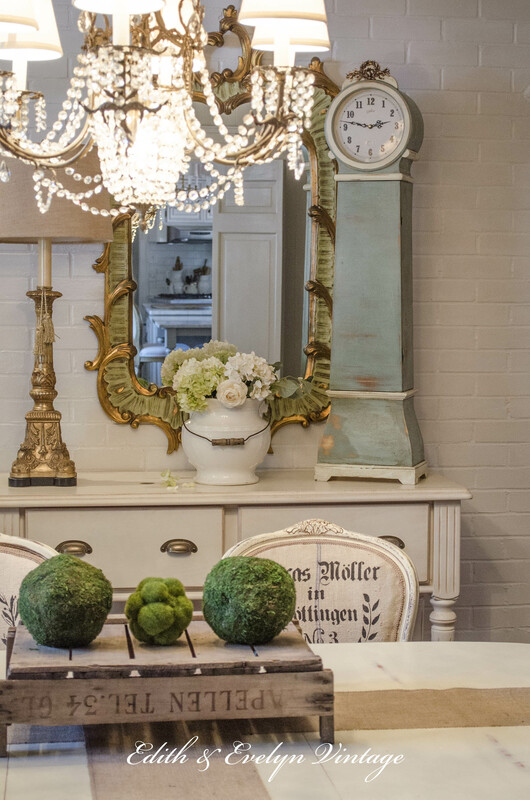 Don’t let chalk paint intimidate you, it’s a very easy paint to work with. Try doing a small piece first just to get a feel for the paint, then move on to a larger piece. I have many antique pieces that I love, some are painted, some are not. I don’t have a problem painting an antique if it’s a piece that I’m not loving as it is. That being said, I do have a couple of antique pieces that I won’t paint, because they are perfect the way they are. It really is a personal choice. There is a source that has a good selection of antique reproduction hardware that might work for you, http://www.vandykes.com. You may find something that will work for your there. Hope that helps! I share your love of Mora clocks, grainsacks, French chairs, well I could go on and on. I love, love what you did with both clocks. Hey Cindy! 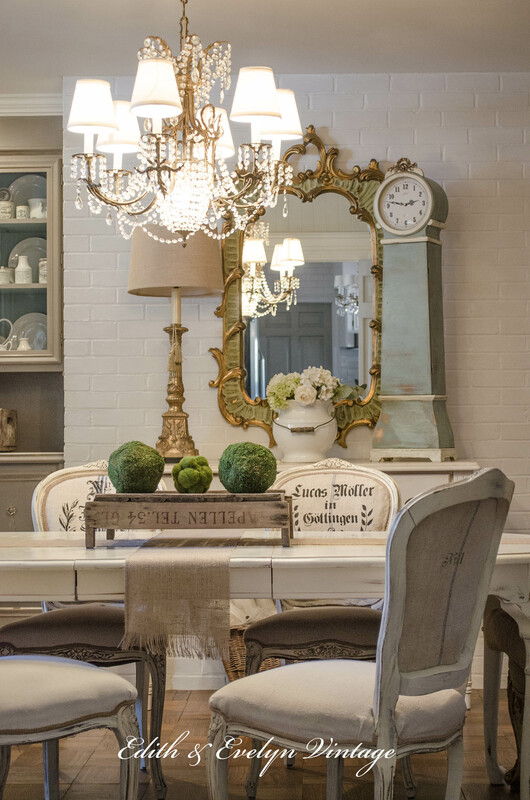 Once again I sit drooling over your beautiful home and your gorgeous clocks! I also love Moral clocks and would so love to have one. They are both equally beautiful and I so enjoyed reading about the history of these charming clocks. I so enjoy reading your blog and look forward to each entry. Thank you for sharing your lovely home with us! 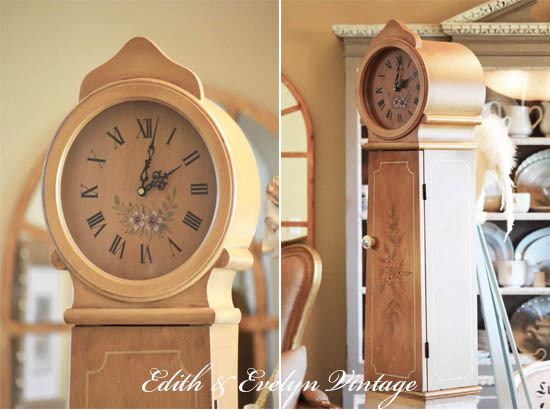 Cindy, Both clocks are beautiful and I love how you transformed the smaller one. Absolutely stunning! Both the before and after. I think had I found it, I would probably leave it in the finish it was originally!!! Love that! At least for a little while *grin*… Beautiful, both!!! I LOVE Mora clocks too. In fact, I recently bit the bullet and purchased one. They are just so fun and whimsical. I wrote about it on my blog. Oh, you lucky girl! I think I will need to come visit and see your Mora! I LOVE Mora Clocks too!!! Love the Mora clocks too! I have a fake one sitting on my bathroom counter. When that real one shows up–go wild!! I bought a repo like the first one shown but, it is as large as the second one. Thank you for the ideas on painting it. 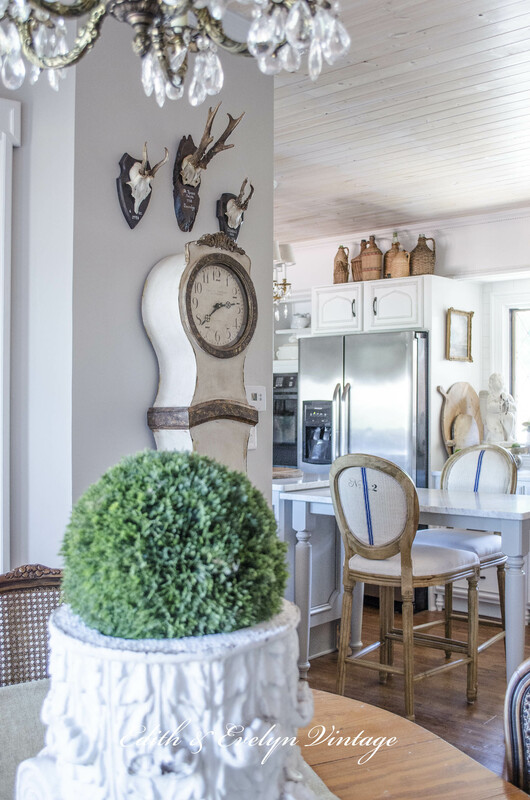 I like the white container with the wooden handle seated next to the blue clock, what is it? Thank you Bara! The white piece is an old ironstone slop jar! Just found it at a recent estate sale. Oh I love it!! I am still on the hunt for a faux Mora clock in my price range. I know, even some of the reproductions can get pricey! 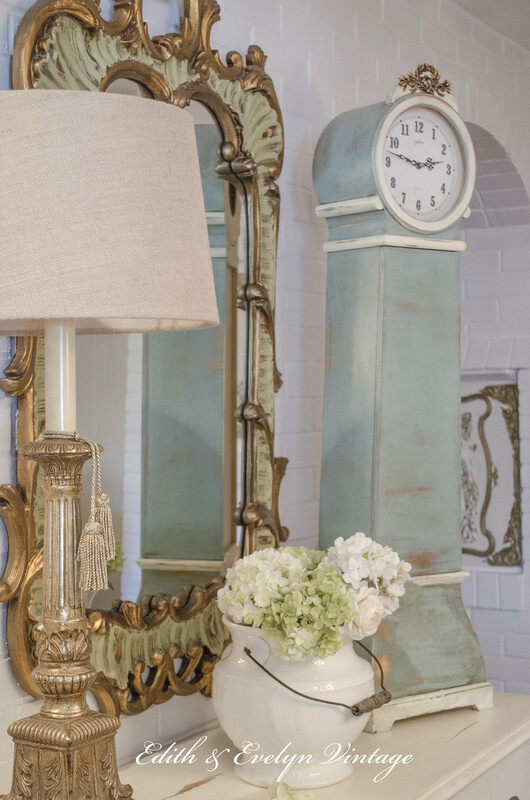 WOW Cindy what a fabulous transformation on that clock…I love the gold decorative piece you added to the top of it!! Love the one in your kitchen too! OMG, if u ever find the real deal, I’ll buy your hand-me-downs!! Love your home, love your taste……u r a marvel! 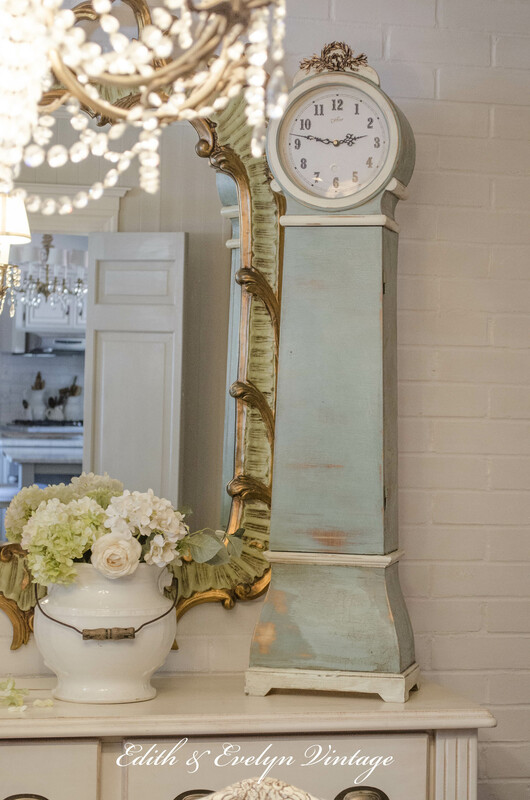 Wow…what a transformation and how great that the clock face fit perfectly….And must say that I love your other reproduction clock…just gorgeous!…I just love seeing your gorgeous home Cindy! Have a great weekend! Thank you Shirley! Have a wonderful weekend! Thanks for sharing all the info on Mora clocks that I did not know. Now I understand why they are so expensive for the real deal. I would love one, too. Happy hunting.